Tart and tangy and absolutely delicious! This is the recipe I promised you last week. I found this recipe for vegan and gluten-free rhubarb muffins at Whole Life Nutrition. I had just returned from The Almonte Farmer’s Market with a beautiful bundle of rhubarb stalks and the desire to bake something not-too-sweet. Tom and Ali were absolutely right when they said that “these little gems won’t last long after being baked”! Next to the 2 cups of chopped fresh rhubarb, this recipe had me at cardamom. I have always loved the unique flavour of this herb which can be found in chai drinks and curry dishes. This recipe from Whole Life Nutrition offers the baker in your house some ingredient choices. This is what I used – brown rice flour, potato starch, melted organic virgin coconut oil, maple syrup, and grated orange peel. The recipe also suggests using blueberries should you not get your hands on some fresh rhubarb. A fruit choice I will be sure to try in August when the blueberries are at their peak. 🙂 Gosh, I love this time of year!! This entry was posted in Breakfast, Desserts and Snacks and tagged breakfast, gluten-free, maple syrup, muffins, rhubarb, vegan on May 26, 2013 by uberdish. I have to share this smoothie! We have made this smoothie every morning this week before school or work and I just made it again for myself this afternoon. We are a little addicted. The original recipe comes from Wanigan Organic Fruits and Vegetables in Brampton, Ontario. Last weekend, I had my husband make a stop there for some fruits and veggies before his trek home. This store has the best variety and the most gorgeous looking produce you will ever see! On the back of his receipt, we found this smoothie recipe. I made one little substitution and one wee addition. I replaced the teaspoon of vanilla extract with a 1/2 scoop of Vanilla SunWarrior Protein Powder and added some grated nutmeg. So, chai-like! This entry was posted in Beverages, Breakfast and tagged almond butter, breakfast, dates, pear, protein powder, smoothie on May 8, 2013 by uberdish. When my husband and I first decided our kitchen was to be a gluten-free zone, we stayed clear away from buckwheat and buckwheat flour because of its name. We naturally assumed that buckwheat was some form of wheat. After some reading and research, we eventually learned that buckwheat is in fact gluten-free and that it is not a grain, but a seed from a plant closely related to the rhubarb family. I love buckwheat flour for its taste and nutritional value. Containing 8 amino acids, buckwheat is very high in protein. In his book Whole Foods to Thrive, Brendan Brazier writes that buckwheat includes “high amounts of the often-elusive tryptophan”. Tryptophan, one of the ten amino acids, helps “enhance mood and mental clarity”. On this dreary cool spring morning, we could all use a little extra tryptophan! Buckwheat is also high in fiber and it gives baked goods a unique nutty flavour. Our pancakes this morning were adapted from Brazier’s above mentioned book. The original recipe calls for hemp flour and barley flakes. I had neither in the house, so I substituted quinoa flour and quinoa flakes. In a large bowl, mix the flours, flaxseed, baking powder, cinnamon and nutmeg. In a food processor or blender, process the banana and water while slowly adding the dry ingredients until a smooth mixture is reached. Transfer mixture to the large bowl and stir in the quinoa flakes. Lightly oil a frying pan with coconut oil and heat over medium heat. Pour scoopfuls of batter in heated pan. Once bubbles appear (a few minutes), flip pancake over and fry for another few minutes. This entry was posted in Breakfast and tagged breakfast, gluten-free, nutritious food, pancakes, vegan on April 14, 2013 by uberdish. Since it was unlikely that I’d get called to work on the first day back to school after a week break, I decided it was a great day to do some baking. This muffin recipe came to mind when I was looking for a muffin that contained no gluten, no eggs, no dairy, and no sugar. Those of you sensitive to gums like xanthan or guar, will be pleased to learn that this recipe contains absolutely no gums. However, you will find baking soda in this recipe. The ground chia seeds holds these muffins together nicely and thanks to the applesauce in this recipe, there is no need for any added oils. These muffins are sweetened with our good ‘ol maple syrup. They have the perfect amount of sweetness, in my opinion. Also, these muffins are a little higher in protein than most due to the almond flour, almond butter and ground chia seeds, not to mention the additional fiber boost. You gotta love that! Preheat your oven to 350 degrees Fahrenheit. Line a muffin pan for 12 with paper liners or lightly grease pan with coconut oil or vegan butter. (I like to use IF YOU CARE BAKING CUPS because they are unbleached and made from recycled board). In a large bowl, whisk together the flours, baking soda, cinnamon and salt. In a small pot over medium heat, whisk together the milk, applesauce, almond butter, and maple syrup until the mixture is warm and smooth. Pour liquid ingredients over dry ingredients and stir. Pour batter evenly into muffin cups or greased muffin pan. Served with a delicious smoothie, these muffins make a great breakfast treat. No guilt in giving these to the kids! This entry was posted in Breakfast, Desserts and Snacks and tagged breakfast, gluten-free, maple syrup, muffins, recipes, vegan on March 18, 2013 by uberdish. Rich in fiber, protein and essential fats, this flatbread is a good choice for individuals wishing to boost their immune system and reduce inflammation in the body. Spread thinly on a teflex sheet or lined baking sheet, this recipe makes an absolute delicious light cracker for soups. As smaller pieces, it makes a savoury and crunchy topping for salads. I served this flatbread earlier this week with my Roasted Garlic, Cauliflower and Celeriac Soup . The following day, I offered it to my kids with a heaping spread of sacha inchi butter as an after school snack. They absolutely loved it! They said it tastes a lot like peanut butter. 🙂 Sacha inchi seeds are a wonderful nut alternative. I took both recipes from one of my favourite cookbooks and resource. Whole Foods to Thrive: Nutrient-Dense, Plant-Based Recipes for Peak Health by Brendan Brazier is a book I highly recommend to those striving for a healthier diet for themselves, their family and our planet. Brendan’s recipes are easy to make and are all allergen free. In a food processor, blend the tomato, raisins, and miso paste until smooth. Add the onion, garlic, and flaxseed powder and blend again to a smooth consistency. Mix in the hemp seeds and chia seeds by hand. I used my dehydrator to dry the bread, but you can certainly use an oven. Spread the mixture on a lined baking sheet and bake for approximately 2 hours at 250 degrees F. Be sure to flip the bread over after one hour to allow for even cooking. When the edges begin to brown, your bread is done. Turn the oven off and leave the bread inside for another 30 minutes. Break into pieces. I prefer to use my Excalibur dehydrator. I spread the mixture onto 2 teflex sheets and set the temperature to 112 degrees F for an optimal raw bread. Cooking food at such a low temperature helps to maintain the food’s enzymes and nutrients. This eases digestion which in turn helps preserve energy. (Ever feel like taking a nap after a heavy meal?). I allowed the bread to dry in my dehydrator for 8 hours (overnight). In the morning, I flipped the bread over and continued to dehydrate it for another hour and a half. I cut my cracker on a cutting board into even (well almost even) rectangular pieces. Process all the ingredients together in a food processor. (My kids prefer the seeds to be a little crunchy. This takes only a couple of minutes of blending). 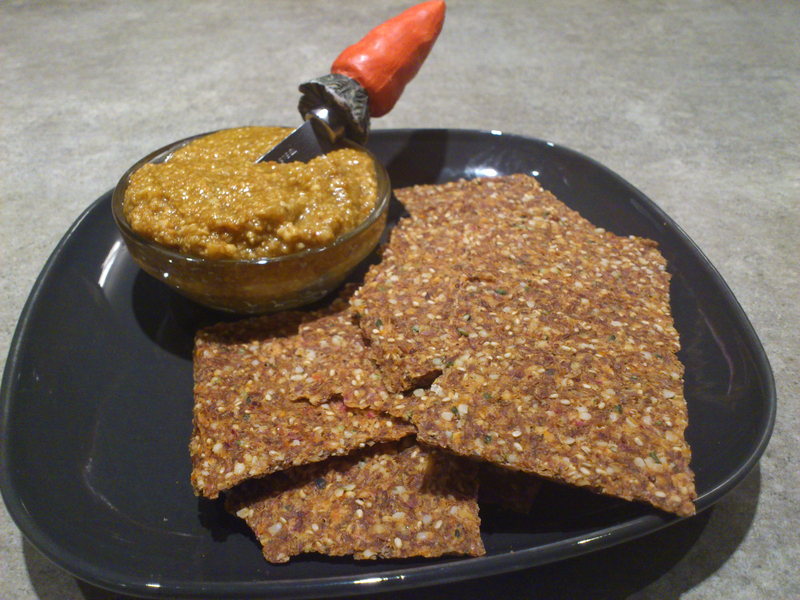 This entry was posted in Appetizers, Breakfast, Desserts and Snacks and tagged brendan brazier, chia seeds, flaxseed, hemp seeds, raw, sacha inchi seeds on February 8, 2013 by uberdish.